This Sunday, tens of millions of viewers will tune in to watch the Oscars, for reasons more or less completely unknown. The award show is never very interesting, and yet … we can never look away. Now, if they introduced a movie poster design category, that might be something worth watching for. And why not? After all, a good poster may not be intrinsic to the film, but it can certainly color viewers’ expectations and maybe even get them in the door. Since we don’t see this happening any time soon, we decided to make our own nominations. Of all the films nominated for an (actual) Oscar this year, these 12 had the poster designs that impressed us the most. Have a look, then vote for your favorite in the comments! There sure are a lot of unexpected virtues to this poster. Using an illustration rather than a photograph is a bold move, but allows for a lot of freedom—with color, for example, and with that awesome gremlin perched on Michael Keaton’s head. The other element that we love is the slightly off-kilter typeface and its highly graphic blocking here. Wes Anderson’s distinctive aesthetic suffuses every detail of his films, including ephemera like poster designs. So we’re not sure exactly whom to give credit for magnificent elements like the model hotel and the painted backdrop (but in any case, bravo). We do know that the poster designer in particular deserves kudos for the unusually engaging placement of the cast billing, which is rendered in an elegant typeface and well-spaced, in a harmonious three-color scheme. 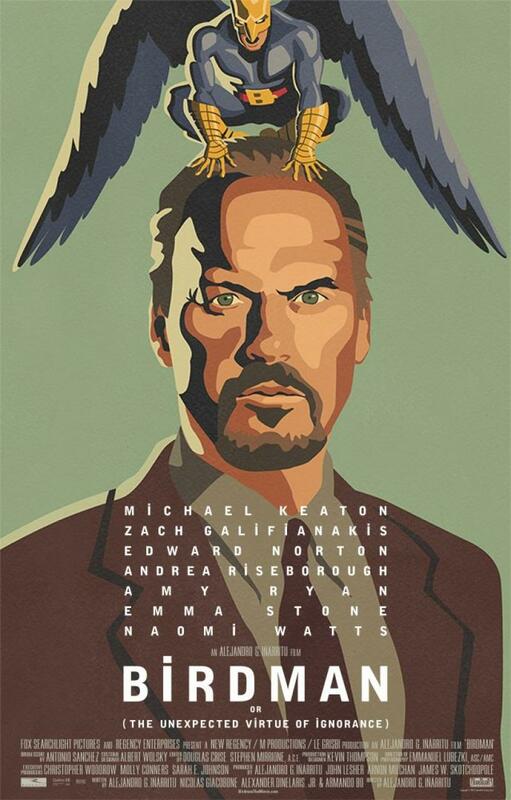 We see some definite parallels between this poster and the one for Birdman: a closeup of the lead actor gazing intensely ahead, before a monochrome backdrop, and ornamented by clever type treatment. Only here, of course, we see Cumberbatch in the flesh. Yet, he is screened from us by lattice of circles containing a curious phrase, the implication of which, we assume, is that the character of Alan Turing is himself the “enigma” in question. Kind of obvious, but impeccably executed. This poster, you will surely notice, does not look like the others. This is fitting: Whiplash is also one of the smaller, more unexpected films to emerge as a top Oscar contender. The poster veers a little too far toward the bland, but ultimately succeeds in its imaginatively collaged composition and self-consciously retro vibe. 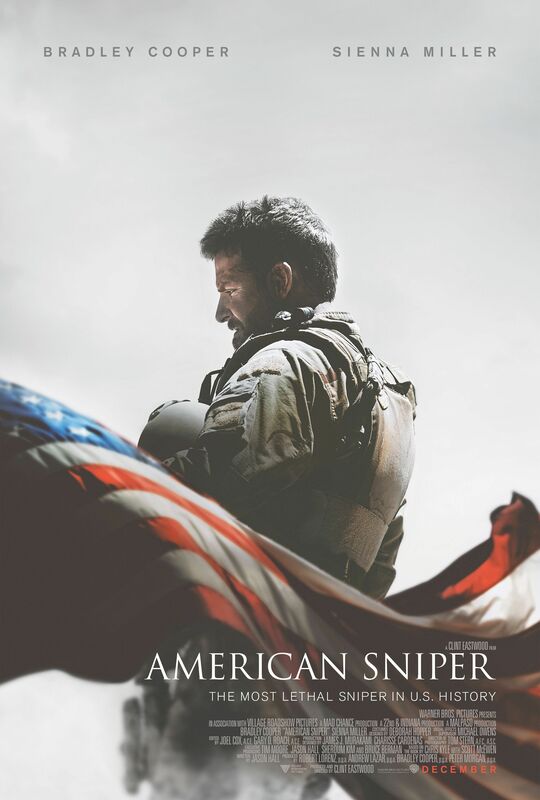 Whatever your feelings toward this film, you have to admit that the poster is pretty darn flawless. The image of the character in profile is a haunting one, which is emphasized by the addition of visual filters that drain the color and accentuate contrasts, giving him an almost statuesque monumentality. Meanwhile, the blowing flag (if superimposed, the addition was seamless) creates a foregrounded zone for text, which is minimal and well-placed. The virtues of this poster are relatively subtle, but we think that they come together to produce an exceptional whole. 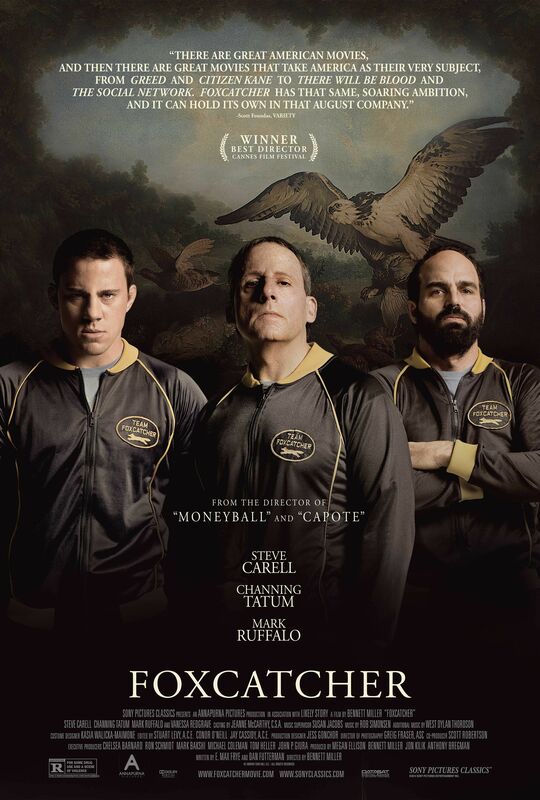 First, it must be acknowledged that part of the poster designer’s job is selecting the best photographic material to work with, and this shot of Tatum, Carell and Ruffalo is just gripping. Second, what the heck is going on with that painting in the background? This element is truly unexpected, even unreconcilable, and yet creates an enthralling romantic atmosphere while also, it so happens, forming a perfect text bubble. Now that’s a close-up. 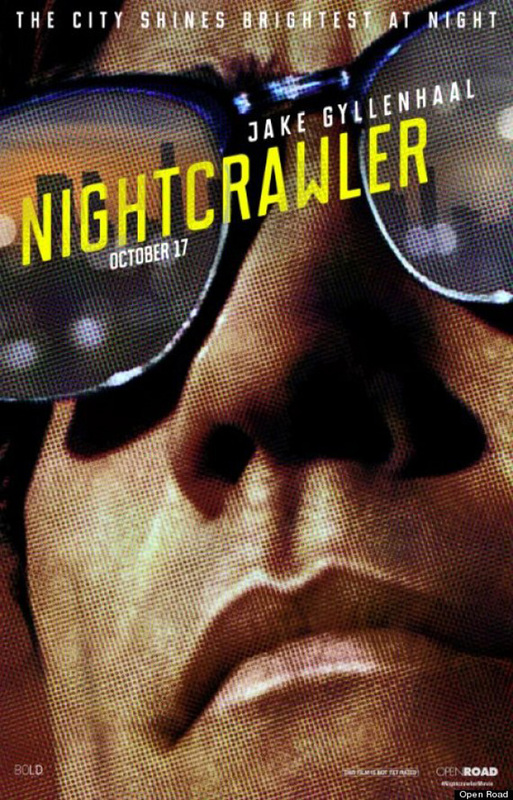 It would be uncomfortably close, in fact, if the designer didn’t use the ben-day dot effect to give Gyllenhaal’s weirdly shiny mug a more flat, abstract quality, which also speaks to the nature of his character. We love how the typeface, in a blaring yellow, slashes across the figure’s sunglasses (themselves reflecting a wonderfully eerie Los Angeles at dusk) at a raking diagonal. If you haven’t heard of it, Leviathan is a Russian film nominated for the Best Foreign Film award. We like the poster for a couple of reasons. First, what the heck is that—a whale carcass? Very weird, very effective photograph to begin with. The image is also nice in how the river divides the poster with a sharp horizontal. The distinctive, blocky typeface echoes this as well as the blue tones that characterize the picture as a whole, resulting in a very well-integrated poster. That is not an expression you can just casually pass by. Moore’s seemingly blank gaze rivets you to the spot, while the rest of this otherwise understated poster does its masterful work. Specifically, we’re impressed by the typeface, which is pin-drop quiet and extremely elegant, the title “Still Alice,” which pops out in white, and the way in which a real wall in the background seamlessly transitions into a pure monochrome field. This film hails from Argentina. The poster is admittedly pretty conventional for an ensemble cast film, but it possesses a number of qualities that were sufficient for it to catch our attention. We like how some of the figures appear seriously beat up, but in a way that is subtle enough to miss at first glance. The striking, modified typeface is another strong feature that meshes with this element, while also adroitly highlighting the deep blue tones that pop up in several of the cast members’ well-coordinated costumes. A very strange movie, Gone Girl naturally produced an equally strange, yet still elegant, poster. It’s all pretty much there on the surface, but we’ll nevertheless point out the elements we like: the eyes, which are reminiscent of the iconic book cover of The Great Gatsby, the well-executed shrouding of the title “Gone Girl” within a cloud, and finally the digitally rendered horizontal bar that distorts the fairly distant figure of Ben Affleck. We saved one of the best for last. Adapted from the labyrinthine novel by Thomas Pynchon, Paul Thomas Anderson’s Inherent Vice is a disturbing yet pleasurable trip through the hazy underworld of post-1960s Los Angeles. The beach bum and soaring legs, bathed in saccharine day-glo light beneath neon text, make an absolutely perfect emblem for the film. A highly unusual poster, unlikely to be forgotten any time soon. Which movie poster design do you think is best? Cast your “vote” in the comments!